Those of you who are still reading likely know that I enjoy looking at things from a couple of different linguistic perspectives, that I like reading and studying both Lexical-Functional Grammar and Role and Reference Grammar. The two theories have a lot in common in terms of presuppositions and theoretical basis, though there are a few major differences as well. For example, LFG assumes Grammatical Relations (Subject, Object) as linguistic primitives, while RRG does not, instead talking about “the preferred syntactic argument” – which is loosely parallel to the Subject. But to be honest, they’re less different on this than it sounds. One of the major reasons for the rejection is the existence of Ergative-Absolutive languages. These are cases languages which are structurally distinct from Nominative-Accusative languages. For Nominative-Accusative languages, the Nominative case is always the Subject, regardless of the transivity of the clause and the Accusative case always the Object of the clause (yes, IE languages allow Accusatives after prepositions as well, I know). But in Ergative-Absolutive languages, what we normally call the “Subject” is split in half. For transitive clauses the “Subject” of the clause will be in the Ergative case and the “Object” will be in the Absolutive case. 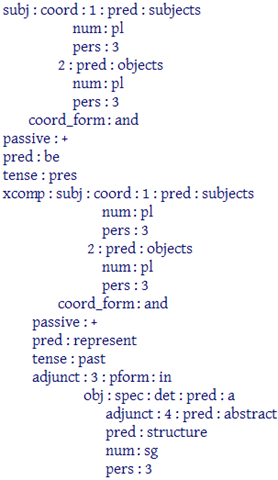 This is the same as N-A systems so far, but it changes for intransitive clauses. For intransitive clauses, the “Subject” is always in the Absolutive case – the same case that the “Object” was in for transitive clauses. Now RRG and LFG both saw this issue. 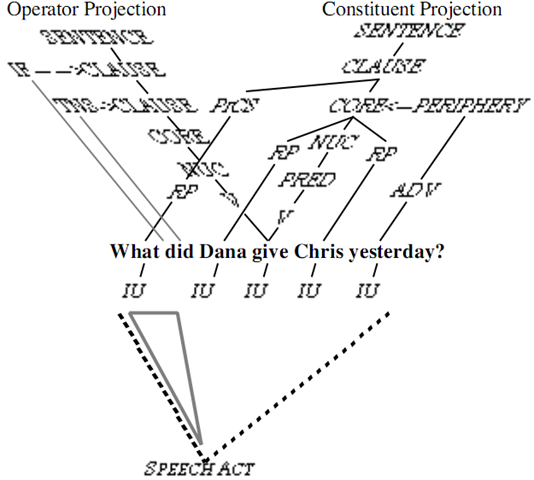 RRG’s solution to the challenge was to say that Subjects and Objects are not universal across language; that at best, we can only talk about the “Preferred Syntactic Argument” of a clause (PSA). LFG followed a different track. They adapted their definitions of Subjects and Objects in such a way that allows for this alternation. So basically, they approached the same problem and provided different solutions. In terms of understanding theoretical frameworks, there is no disagreement here because were an LFG practitioner to accept RRG’s definition of Subjecthood, they would recognize RRG’s solution as valid and beneficial. Likewise, were an RRG practitioner to accept LFG’s adapted definition of Subjecthood, they would agree that the challenge of Ergative-Absolutive systems is not an issue either. In a sense, then, this particular difference between the two frameworks is somewhat superficial. That’s a lot of information in one place. Subjects and Objects are represented in an abstract structure. 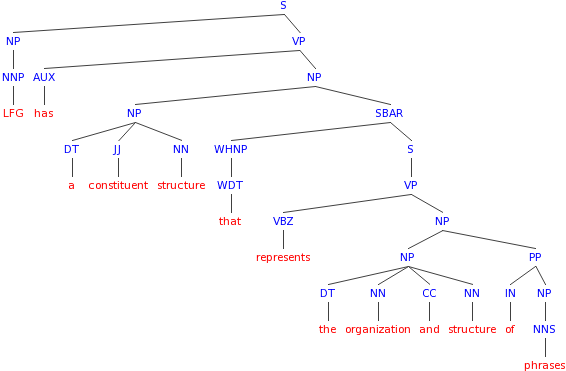 There is also a third structure for Discourse-Information structure, which unfortunately, I cannot show here without an excessive amount of work (the other two come from a probabilistic parser, HERE). Either way, LFG and RRG follow two very different methods for the visual representation of grammar and syntax. And up until recently, I didn’t really have any opinion about which one was better. The organization that hearers associate with a discourse is not simply a matter of the linguistic structure that appears. Rather, on a more fundamental level, it is a reflection of how the content comes together and is stored in the mind. The forms of language that the speaker uses certainly play a part in this, but psychological research shows that the way hearers understand, store, and remember a discourse corresponds only partially with what was actually said. Dooley Robert A. and Stephen H. Levinsohn, Analyzing Discourse: A Manual of Basic Concepts (Dallas, Tex: SIL International, 2001), 10; my emphasis. So here’s my question, if Dooley and Levinsohn are correct about how we remember a give discourse, which visual representation fits this more accurately? The one where everything is thrown together? Or the one where different grammatical elements are represented separately? As of this morning, I’m leaning toward the latter. This is not to say that I think LFG’s separate representations accurately depict the mental representation of a given sentence. LFG’s representation is mainly to provide a strong computational basis, but I do think that it might be closer to what the human mind does in comparison with RRG’s representation. And incidentally, that book by Dooley and Levinsohn should have gone on my bibliography, thoughts its not a particularly exciting read and at times its downright hard. My question is, how could a visual representation support Dooley and Levinsohn’s statement? I thought their statement is about information processing and retention, not information representation. Probably your leanings are influenced by your Indo-European language background? I’m quite interested in this topic as I am now reading a lot of grammar frameworks, especifically construction/cognitive grammar frameworks by Langacker, Fillmore, Goldberg and Croft. I like RRG and LFG for different reasons, LFG for its computational formalism and parseability and RRG for the typological soundness of its clausal structures and primitives. I do not mean that when both of them are synthesized and reduced into one new model, we already have a complete model. That’s why I’m seeing some interesting aspects of Construction Grammars. Anyway, have fun with your language studies. Okay, I think you miss read something here. I never said a visual representation could support Dooley & Levinsohn’s statement. I said the exact opposite. I was wondering whether Dooley & Levinsohn’s words could support LFG’s separation of functional and discourse information from constituent structure. So yeah, I was never trying to support Dooley & Levinsohn’s statement. And nothing I said conflicts with the fact that the were talking about information processing and retention. My only question was whether their words about information processing might make that LFG’s visual representation more cognitively valid than that of RRG. When you say “Probably your leanings are influenced by your Indo-European language background?” are you talking about the fact that I’m an English speaker? Or are you talking about the fact that I’m studying Greek? Either way, I’m not sure what it has to do with my little musings here. That quite seems irrelevant. As for the typological adequacy of RRG, it does do a nice job most of the time, but its not perfect. Ironically, Van Valin’s approach to voice is completely Anglo-centric and does nothing for languages that have Active-Middle alternation voice systems rather than Active-Passive alternation voice systems. Yeah, my mistake, after re-reading it. You said it’s D&L’s statement that is hypothetically correct, so you asked if it could agree with LFG. When I said “Probably your leanings are influenced by your Indo-European language background?” what I mean is that since you’ve encountered (spoke and think? )mostly Indo-european languages, you’re likely to find LFG more ‘cognitively valid’, as it’s heavily more like it. I don’t know if you speak another non-Indo-european language, but your blog seems to indicate that. Nothing wrong with it, just connecting that with your conclusions about LFG and Dooley & Levinsohn. I could be wrong. It could be that you find LFG more ‘cognitively valid’ because LFG is purposely modelled to be computation-friendly, which is its strength over RRG. RRG has not caught up yet in that field and moving to be integrated with CG, in LCM. Of course, RRG is not perfect. I’m seeing some aspects in there as well that I think hasn’t gone far enough, but I can say it is far better than LFG in terms of its representation of constituent structures, with its attempt to be a more or less universal grammar more successful than that of Chomsky’s. Personally, I wouldn’t relate D&L with either LFG or RRG, but with CG, perhaps. Okay, I see what you’re saying. Let me divide it out for you in terms of how I view frameworks generally. My initial rule about linguistic frameworks is that they’re tools and you only use certain tools for certain tasks. Specifically, no linguistic framework has everything right. In terms of my statement about D&L with LFG, it was only limited to the separation of functional & discourse information from constituent structure. I would not necessarily say that LFG’s organization in any other way in necessarily more or less cognitively or typologically adequate than RRG (or FG or CG for that matter). But I do think that since LFG allows constituent structure to be virtually completely language specific, it can say things about language differences that RRG cannot – or at least not as easily because everything looks exactly the same, which is its own strength. I consider LFG typologically strong for their emphasis on lexical rules for things like voice, which does a much better job for languages with middle voice systems or Filipino voice systems. And I also value their constituent structure for marking and noting what is different and unique among languages. The ability to see what’s different, in many way, actually makes it easier to see what’s the same in terms of classifying and categorizing languages – particularly on things like how langauges configure their word order, whether through Information Structure, through Grammatical Relations, or some sort of hybrid between the two. I consider RRG typologically strong in its lexical representations and use of macro roles, thematic roles, and verb specific semantic roles. And I also value their semantically based constituent structure hybrid for very helpfully emphasizing how languages are similar. RRG emphasis on having a semantic basis for distinctions within syntax is also extremely helpful and provides a strong basis, I think, for making clause about what is and what is not a phrase.